Hi! 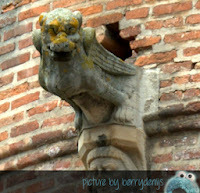 Here me again with a blog about me vacation in France. 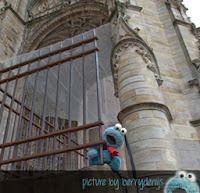 Because me did not only eat sophisticated cookies me also went sightseeing. 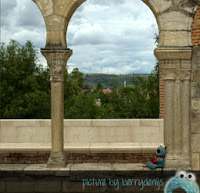 One day we drove to the gorgeous city of Albi. 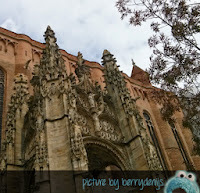 A fortified city with this beautiful cathedral slash fortress that was used by the Pope in the Middle Ages. One time, you must know, there were two popes. One lived at the Vatican in Rome and the other in Albi, France. 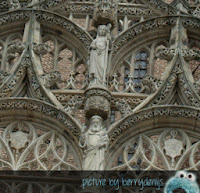 Well, me is only a little blue monster, but this Cathedral in Albi made me feel like a tiny monster! Don’t you think it looks gorgeous! Me even took a peek inside. There are really impressive paintings on the ceiling and walls. And the outside is so pretty too! After all that beauty me went sightseeing around the Cathedral. Don’t you like this little peek-through? 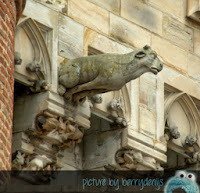 Me also had a nice fresh panini from the baker on the corner and me ate it in front of the Cathedral so me could study the gargoyles that are looking over the people of the city. Like quiet witnesses of history… Me wonder what kind of stories they could tell us if only they could talk… But just look at them. Gorgeous huh! Next week me will tell all about a beautiful Lioness me saw on vacation!